Since the last task was sort of a double, I don’t feel too bad having skipped a week. I’ve been too busy for my own good, and the last two weeks got completely out of control. I feel like I didn’t really get a summer. School has started back up already, and I’m still wanting it to be the end of May! I changed my rotary cutter blade, and I’ve done so much cutting since then, I think it might be time to change it again already! Even though I haven’t posted about it, I’ve been doing some organizing. I’m working on the storage closet in my office, and I’m just about to get it finished. I’ll show you that once I get it done. My cutting table is still a total disaster. I still have piles everywhere. And I still have a lot of scraps to deal with, and fabric that needs to be put away. Oh, and I’ve also added to my UFO list! Or technically, my WIP list, if you prefer to call it that. Is there really any hope? 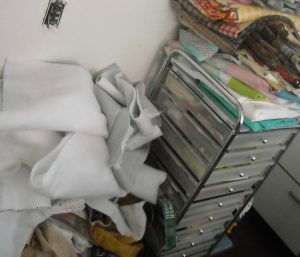 I currently have three piles in my sewing room floor, but by the end of this week, I hope to have ZERO. See this rolling cart of drawers? It’s full, and I had decided that I would NOT order another one — I simply need to get rid of things. However, I broke down and ordered one — not because I gave in, but because I decided it would really come in useful in the next room that I’m fixing up. I’ll have one in each room for storage, of things that would normally just be left laying out. So in the name of neatness, I have another one on the way. I’m sure I can fill it up the instant I get it assembled! See the pile on top of the rolling cart? All quilt tops that I need to get quilted. But there’s never any time to quilt anything of my own if it doesn’t have a deadline — uff! There’s at least 10 quilt tops in that pile right there! See the pile on the floor beside the rolling cart? Most of that is trimmings from quilts that I’ve finished quilting and then had to put the binding on. I just throw it over there and tell myself I’ll deal with it later. Now is the time! I’ve been watching folks on Instagram showing pictures of their tidied-up studios, and mine is still just a total disaster, even in spite of weekly organizing tasks! I plan to work on it this week. I at least want to be able to walk around my cutting table without tripping on something that’s in the floor and shouldn’t be! How about you? Is yours this bad? Or am I alone? Have you had time to keep up with yours? Or have you had a crazy busy summer, too? What are you going to tackle this week? I need to get something quilted so I can bind it on Wed.
I’m in the middle of refolding my fabric onto comic book cardboard. Boy does that take time. I’m glad my yard-good stash isn’t as large as some. It’s the selvages and little scraps that I collect and they require some wrangling, too. And the next time you are tempted to pile stuff “for later”, get out your timer and set it for 15 minutes. I bet you can put away/cut/toss that “would-be pile” before the timer goes off. And then you wouldn’t have that pile to deal with “later”. I’m definitely in the camp of I’ll Clean This Later, because who wants to do that rather than quilt? However, I’m really good at it when I want to avoid something. Heehee. I had my floor cleaned up recently, but now it’s a mess again. I’m going to try to tackle that this week. Life has been a little crazy here too — where did the summer go??? Here’s to a quiet September, hopefully! I had to move my studio last week so was forced to straighten up and start over. The cutting table is already full, but the floors still look pretty good. Give it time. Argh. The floor. I would SO like to have some floor that isn’t covered by STUFF. I don’t know that I can get the entire floor free – actually, I’m pretty sure that I CAN’T finish the entire room – but I can certainly get rid of one pile at least. Great time for challenge of cleaning up some floor space….company coming to visit next week. Will let you know how it goes!! You know , even the week where I don’t say anything, I enjoy your comments.I constantly clean. However I am sewing more and each time I enter my lovely special room I let fabric fly. We have had two days of autumn winds… I have had the urge to FINISH THINGS. I finished a quilt, a quilt top, a new block for the Penobscot county quilt..and found a bit uf unfinished needle turn applique that I cut done re arranged and fit into another quilt… yay. All my extra time for a while will be spent cleaning up the old homestead. We are going to sell it, Lord willing. We need to eliminate piles of junk. So that will be the piles I work on. I did one yesterday. And we burned lots of old fallen tree limbs. I’m happy to report that I completed this task a couple of weeks ago, and there’s not a single thing on my sewing room floor that doesn’t belong! Cutting table is cleared, and the room looks pretty again. It’s such a great feeling to go in and sew. I suppose I should be grateful that I share my swing space with the kids’ toys, as there is no option to take care of it later. If I don’t put it away pretty quickly, destruction will follow me! well even tho I have been so quiet I got two thrills this week end. One I was looking in the Connecting Thread Catalog and there was your BOOK. Second I was in New Hampshire for quilting with a friend in her new studio. there was one bag of just Miss. Star buys that I could not even pick up…We helped put away 20 years of buying fabric and we refolded it all using the 18 inch fold method. WOW WOW You organized Sarah’s studio indirectly. I have a photo I will share.